S.U.C.C.E.S.S. - What drives us is the well-being of children. Step-by-Step - We ensure the participation of all children in the day-to-day joys of childhood. Fraser Health - We’re committed to making the healthy choice the easy choice. 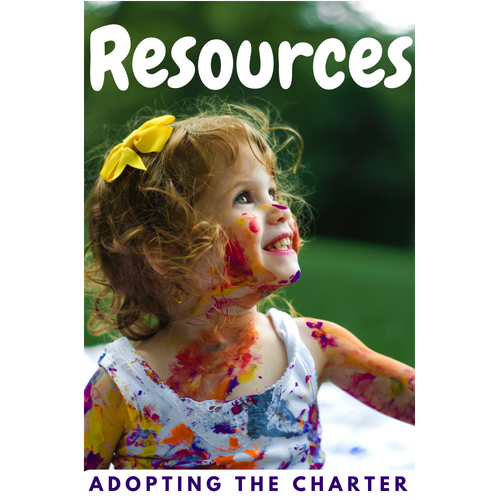 Community Snapshot - Moving forward with kids in mind. The rights to be loved and to nutritious food and healthy living are woven in everything we do at S.U.C.C.E.S.S. What drives us is the well-being of children. Families with children ages 0-6 who speak Cantonese, Mandarin, Korean and Farsi, can access our Multicultural Early Childhood Development Services to succeed in their new lives. We firmly believe parents want the best for their children but when stressed, it can be difficult to show up. Our goal is to ensure immigrant families are equipped with what they need to be self-sufficient, comfortable and confident in connecting with their new community. 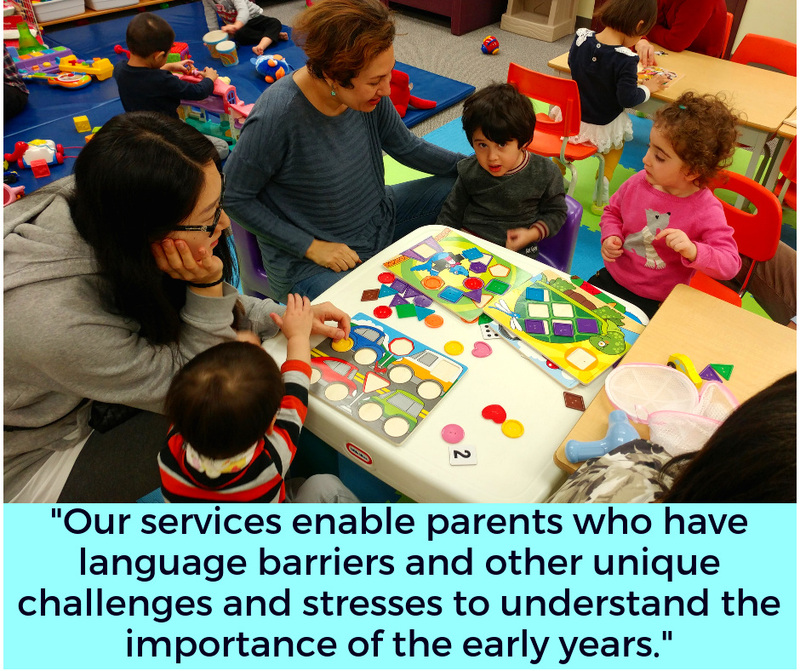 Our services enable parents who have language barriers and other unique challenges and stresses to understand the importance of the early years. We equip parents with the knowledge and skills that will allow them to be present with their children in all aspects of their lives. When you cannot fully understand the second language you are learning, it can be challenging to be completely involved in your community and in your child's life. We provide services in a parent’s first language, such as parent support groups and other programs. We also advocate within our community to remove barriers to access. One of the ways we do this is by working together with our partner agencies to ensure that families are able to participate in local Early Childhood Development activities and services. In addition, we invite agencies to speak at our parent support groups and to visit our Family Resource Centre to bridge families with these professionals. Meeting a familiar face at S.U.C.C.E.S.S., such as an Infant Development Program staff, can help parents reach out in the community when they need to. If a parent is stressed, isolated and disconnected from community, this can take away from being completely present for their children. We emphasize self-care and can refer families to a range of other S.U.C.C.E.S.S. services, including employment services, immigrant settlement and integration program services as well as clinical counseling. We also offer opportunities for social networking and self-care with programs, such as Mother's Night Out and Parent and Tots Drop-in, where parents can connect with other parents. Within all of our workshops, we model healthy living by providing healthy snacks such as fresh fruit, and by emphasizing outdoor play and movement. We teach immigrants about using local foods in their meals through our food skills program and promote a lot of the LEAP activities and Live 5210 programs, such as Play Boxes and Unplug & Connect. Having strong connections with partner agencies allows us to refer our families to other agencies and get referrals from them. This ensures that we can support immigrant parents to nurture themselves and the well-being of their children with greater impact. To learn more about us, visit the main S.U.C.C.E.S.S. page. How does Fraser Health support a child’s right to nutritious food and healthy living in the Tri-Cities? 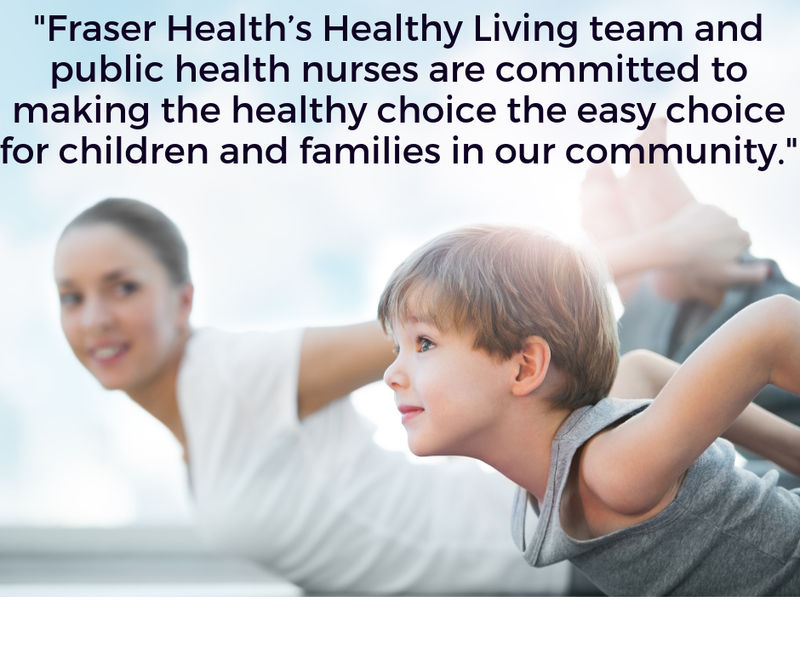 When it comes to nutritious food and healthy living, Fraser Health’s Healthy Living team and public health nurses are committed to making the healthy choice the easy choice for children and families in our community. Our group of public health professionals works to improve the conditions that influence healthy living in the Tri-Cities, and support children and their families through a range of public health services. What does the Healthy Living team do? Supporting the development of healthy environments requires health authorities, local governments, schools, businesses and non-profit agencies to work together. The Healthy Living team works in partnership with the community to promote healthy eating, physical activity, mental wellness and tobacco reduction. The Healthy Living team is composed of community health specialists, healthy school public health nurses, and public health dietitians, and is guided by the local medical health officer and executive director. They work with city, community and school district partners on programs, policies and initiatives that support health, such as promoting Live 5-2-1-0 healthy messaging. They also liaise with other Fraser Health programs and services. Our public health dietitians play an active role in developing nutrition-related programs, education materials and tools, and provide updates and recommendations to support health care professionals and child care providers in the Tri-Cities. They help service providers make informed decisions about nutrition and offer relevant, evidence-based programs and information to children and their families. What do public health nurses do? Through our Public Health Unit, a team of dedicated public health nurses provide several services that support nutrition and healthy living for pregnant women, infants, children and youth. Some of these services and programs include breastfeed support and clinics, the Nurse Family Partnership and enhanced public health nurse family visitations to support children and families with greater needs, as well as our Best Beginnings program to help ensure a healthy start for new moms and babies in the Tri-Cities. For more information about the Healthy Living team or the programs and services available through the Tri-Cities Public Health Unit, please visit Fraser Health’s School Health page and our Children and Youth page. Step-by-Step Child Development Society provides families with a sense of belonging. A child’s right to be loved and have a family are important cornerstones of our programs. By working closely with the children and families within our community, we are able to provide quality programs that are reflective of the needs of the community we serve. Families who participate in our programs come from all walks of life and are welcomed! The Society pioneered inclusive education with a preschool program at Harbour View Elementary where extra needs and typical needs children could learn and play side by side. Over the years the mandate has changed, however Step-by-Step continues to focus on services and support for children and families who might not otherwise be served. We want all of the children in our care to feel a sense of community and belonging. 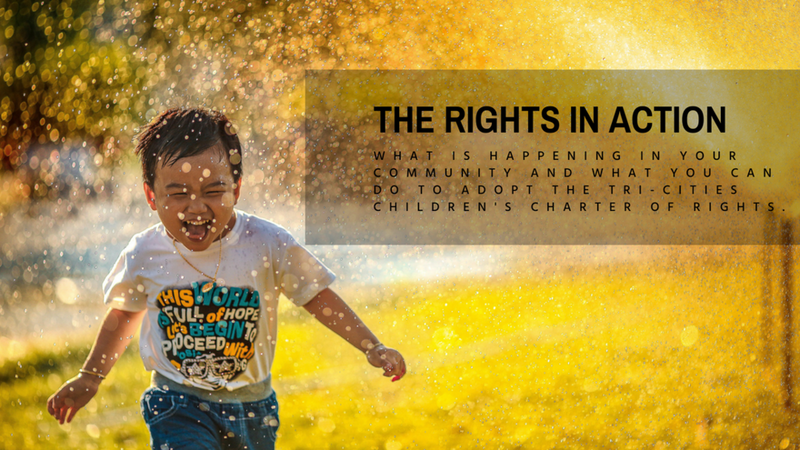 All children have the right to be loved by their parents, caregivers, and friends. To support families we offer our Free Family Resource Program at two different locations (Harbour View School and Old Orchard Community Centre). This provides opportunities for parents and caregivers and their young children aged birth to 6 years to meet and build relationships with other families in their neighbourhoods while accessing information and resources through our Family Resource Program. This program runs from September until June. This is a community where we share our thoughts, listen to one another, actively participate together, read together, sing together, and have fun together! Step-by-Step offers a child care program that focuses on relationships with children and their families. We strive to offer fun based programs with the emphasis on each child in the group. There is a balance on inside and outside play, small and large group games, creative challenges, a balance of busy and quiet play and so much more. Our school aged programs service Harbour View Elementary School and Porter Elementary School. 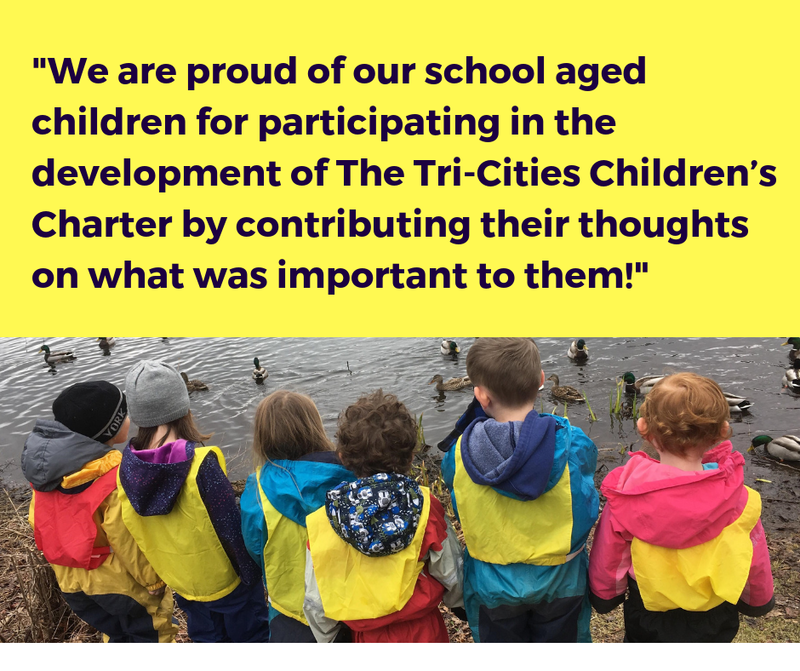 We are proud of our school aged children for participating in the development of The Tri-Cities Children’s Charter by contributing their thoughts on what was important to them! That each child leaves feeling good about who they are. That each child leaves with an acceptance of others. That each child leaves with a growing excitement for learning. All of these programs are centred on the well-being of each individual child and their family. Step-by-Step strives to ensure the participation of all children in the day-to-day joys of childhood! The First Nations Education Steering Committee (FNESC) has produced a poster with the following principles that can be used in our learning environments. Download the poster. The Spirit of the Children Society walks in love, honor and respect to learn, share our identity, and heal together. Visit the main webpage and follow the programs and services links to learn more about program offerings and support services. Bike and foot patrols to support crime prevention programs like Lock Out Auto Theft and Stolen Auto Recovery. Taking non-emergency police reports at CPSs for minor incidents such as lost and found property. Attending community events to do outreach and education and deliver public safety programs such as Child I.D. Spearheading new initiatives to address real public safety issues, like the Bait Locker program." Find CPS locations and other information on the RCMP Community Policing webpage. Port Moody residents can find information on community policing in the Services & Programs menu of the Port Moody Police Department webpage. Visit your local library to find out more about the programs they offer that promote the well-being of children and families.